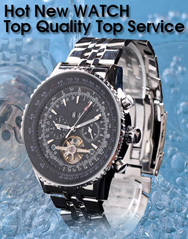 Luxury Watch Source - You can find a great collection of luxury watches, pictures gallery with it, specs about the watches, specs about the prices. Rating system for watches and more. Affordable Watch Reviews & Blog | Watch It All About - Watch It All About is a watch review site and blog dedicated to affordable watches. We try to find and review the best watches available under £500 - ones which offer the best value for money, or the highest specs for the least amount of money.